Paul J. Saunders is Chairman and President of the Energy Innovation Reform Project (EIRP). He was previously Executive Director of the Center for the National Interest (CFTNI) and a member of the Center’s Board of Directors and remains a Senior Fellow in U.S. Foreign Policy at CFTNI. 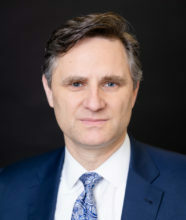 He was the Center’s Chief Operating Officer and directed its U.S.-Russian Relations Program in addition to leading projects on other issues, including energy and climate change and U.S.- Japan relations. He was also Associate Publisher of the foreign policy magazine The National Interest, published bi-monthly by the Center for the National Interest. Mr. Saunders served in the Bush Administration from 2003 to 2005 as Senior Advisor to the Under Secretary of State for Global Affairs. In that capacity, he worked on a broad range of transnational issues, including energy and climate change as well as a variety of regional issues. Earlier, Mr. Saunders served as Director of CFTNI from 1997 to 2003 and was Assistant Director from its founding in 1994 until 1997. In 2000, he was a Senior Policy Advisor to the Speaker’s Advisory Group on Russia, established by the Republican Policy Committee of the U.S. House of Representatives. He has written extensively for major newspapers and journals, and is a frequent commentator in national media, including CNN, Fox, and MSNBC. Mr. Saunders is the author or editor of works including A New Direction in U.S.-Russia Relations? America’s Challenges & Opportunities in Dealing with Russia; Extended Deterrence in a Changing Asia; Essential Partnership: The U.S., Europe and Climate Change; Russian Energy and European Security; and Russia and the Greater Middle East: Challenges and Opportunities (with Geoffrey Kemp). Saunders holds a B.A. in Political Science and Russian and East European Studies, an M.A. in Political Science, and an M.A. in Russian and East European Studies from the University of Michigan.